/Penny Parsons/ Charles Edward Johnson, a.k.a. Jody Rainwater, passed away in his sleep on the evening of Saturday, December 24, 2011, following a lengthy illness. He was 92. Jody was born on April 13, 1919 near Mount Airy, North Carolina. He began his musical career in 1936, on WMFR radio in High Point. After serving in the Marines during World War II, Jody teamed with Woody Hauser in the Blue Ridge Mountain Boys, at WTOB in Winston Salem. There, Jody began to hone his skills as a comedian, adapting the stage name, "Little Jody." The legendary bass player also played mandolin and did all of the booking for the band. In 1948, he joined Smokey Graves & the Blue Star Boys at WDBJ in Roanoke, Virginia. In the fall of 1949, Jody joined Lester Flatt and Earl Scruggs in Lexington, Kentucky, as their booking agent. He soon began doing comedy routines with the band, and when Cedric Rainwater left the Foggy Mountain Boys in the summer of 1950, Jody took over as bass player and bass singer. Jody made his first recordings with the Foggy Mountain Boys in October of 1950. Just a month later they were in Nashville for their first Columbia session, which included Jody's original song, "I'm Waiting to Hear You Call Me Darling." Their two sessions in 1951 produced fourteen songs. Jody sang the bass vocal part on the three gospel quartets: "I'm Working on a Road," "Get in Line Brother," and "Brother, I'm Getting Ready to Go." 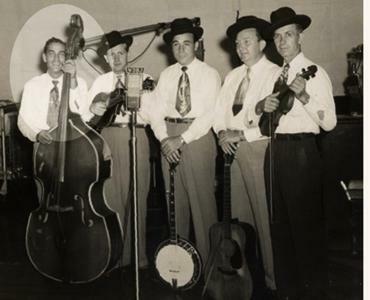 Jody remained with Flatt & Scruggs until June of 1952. His communication and business skills made him a natural for radio work, and he settled at WSVS-AM in Crewe, Virginia, near Richmond. Jody was the station's morning disc jockey for almost 20 years, playing country and bluegrass music. He was one of the station's most popular air personalities ever. Jody also continued to play music on the side for many years with his band, The Jamboree Gang. During his time at WSVS, Jody often brought bands into the station to perform live, and was responsible for Flatt & Scruggs spending about five months based at WSVS in 1954. Jody also promoted concerts, and he served as emcee for these and for other concerts in the Richmond area, and later at bluegrass festivals around the southeast. After leaving WSVS in 1971, Jody worked at various radio stations around Virginia and North Carolina until his retirement in 1984. In recent years, Jody again became involved at WSVS radio, as a consultant, mentor, and elder statesman. He was inducted into the Virginia Folk Music Association's Hall of Fame in 2000, and was honored by the IBMA with a Distinguished Achievement Award in 2009. Jody is survived by his wife, Emma, daughters Pat Johnson and Charlie Rainwater, son Ronald L. Gallagher, eleven grandchildren, and eight great-grandchildren. He was preceded in death by sons Jerry M. Johnson and Robert T. Gallagher, both in 2004. Visitation will be on Tuesday, December 27 at 6:00 PM and funeral will be on Wednesday, December 28 at 1:00 PM, both at Jennings-McMillian Funeral Home, 200 W. Carolina Avenue, Crewe, VA. Following the service, burial will be at Trinity Memorial Gardens in Rice, VA. In lieu of flowers, the family has requested that memorial donations be made to: The Virginia Museum of Radio Entertainment (VMRE), PO Box 47, Crewe, VA 23930. A special fund has been set up in Jody's memory to support the Museum's educational programs in area schools. The VMRE is a 501(c)3 non-profit organization.